Famous Hudson River School painter Albert Bierstadt was commissioned by the Earl Of Dunraven to paint locations around Estes Park as well as to scout an aesthetically pleasing location where the Earl would build his English Hotel. Bierstadts paintings were bold and dramatic showcasing the landscape and the elements in a majestic manner. This particular morning at Bierstadt Lake the weather and elements came together in a manner reminiscent of one of Albert Bierstadts paintings. Light rain was falling as I stood along the shore of Bierstadt Lake. It appeared that sunrise would be a no a show due to the rain. For a brief minute the sun beamed through the clouds and this rainbow appeared over Bierstadt Lake. Hallett Peak and Flattop Mountain, both partially obscured by clouds turned red and pink along with the sky. 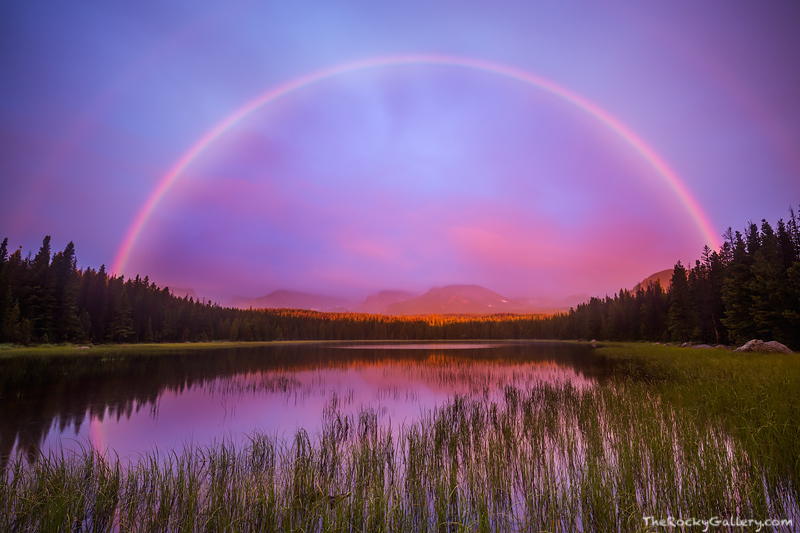 It was a once in a lifetime moment and one of the most beautiful scenes I have personally witnessed in Rocky Mountain National Park.
. Photo © copyright by Thomas Mangan.